Photography students at The Sixth Form College, Solihull are learning what it is like to work as a freelance photographer after getting a commission from a real client this term. 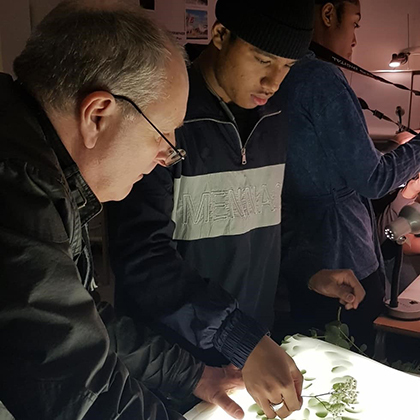 Professional commercial photographer, Steve Carse, visited the College last week to work with first year A level Photography students on a live brief for Fleur de Lis florist in Solihull and the students have four weeks to complete the project. Students are being asked to produce an ‘Instagram 9’. This is a set of nine images that will be posted simultaneously on the client’s Instagram page to create nine squares in a grid. The client would like these images to be cohesive as a series and will need motifs that run through all of the images, perhaps through the use of colour, the use of the same flowers or plants or the use of a similar ‘style’. As well as having their photography featured on social media, a selection of photographs will also feature on a square window pane on the shop’s frontage. These images will also be printed and exhibited in College.